Yesterday was more work, more swim, and an ice bath. Arash should be finishing the final PDF of the DPP 4 RAW Conversion Guide today. We hope to have it for sale this coming week. This blog post, the 323rd in a row, took me about 3 hours to prepare. It was published at about 7:30am from my home at Indian Lake Estates, FL. Monday full day, two 3+ hour photo sessions plus a working lunch with image review and Photoshop: $300. Monday morning only with a working lunch (lunch included) with image review and Photoshop: $200. All quite a bargain. The limit is 6 but I am hoping for at least one :). Please call me at 863-692-0906 on Sunday between 9:15am and 7:00pm with questions or to register. If no answer, please shoot me an e-mail, and include a call back number. I hope that you can join me. Those who are staying over on Sunday or Monday are invited to call or to write for motel info. I just booked my room for Monday night and they likely have rooms for Sunday night as well. This Great Blue Heron image was created on the morning of October 18 down by the lake near my home with the Canon EF 600mm f/4L IS II USM lens, the Canon Extender EF 2X III, and a beta version of the Canon EOS 7D Mark II . ISO 400. Evaluative metering -1/3 stop as framed: 1/2500 sec. at f/8 in AV mode. AWB. #1: This JPEG represents the unsharpened 600 II/2XIII/7D II image after RAW conversion in DPP v3.14.41.0. 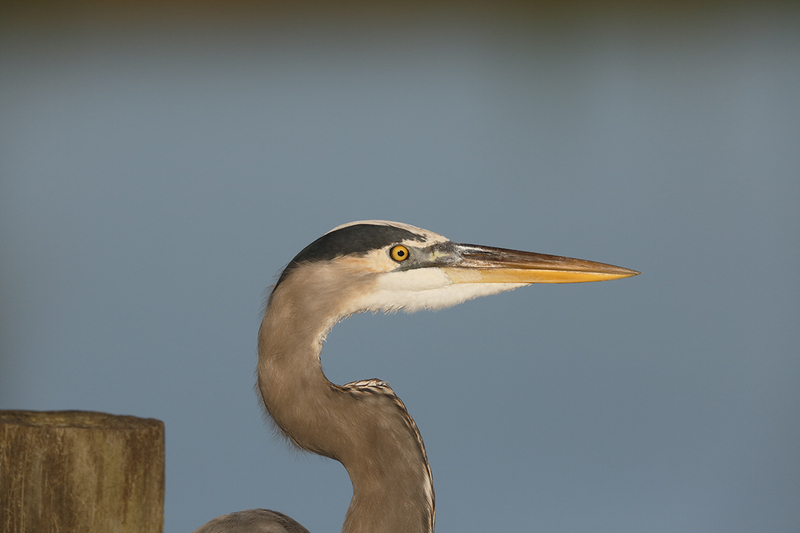 Note that in the image above, the one made with the 7D II and its 1.6X crop factor, the heron’s head is turned about 1 1/2 degrees towards us. 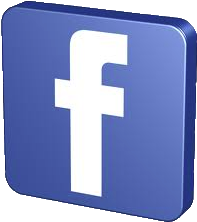 Hi Jim, Thanks for sharing your thoughts and the info above. I have long tried to stay out of discussions on this topic as I really do not understand the concept very well, I am not very good at pixel math, and I feel that the arguments are in large part semantic in nature… Lastly, seeing the image larger in the frame and larger on the LCD viewing screen gives many folks added confidence… That said I will try to remember to shoot some side by side images with all three cameras when I get my hands on a 7D II. I will likely need a sleeping bird. Heck, even I thought that it would be easy…. Same bird, same time, same place. This one created with the Canon EF 600mm f/4L IS II USM lens, the Canon Extender EF 2X III, and the Canon EOS 5D Mark III . ISO 400. Evaluative metering at zero: 1/2500 sec. at f/8 in AV mode. AWB. #2: This JPEG represents the unsharpened 600 II/2XIII/5D III image after RAW conversion in DPP v3.14.41.0. Converting the 5DIII image in DPP 4 would have given it an unfair advantage. 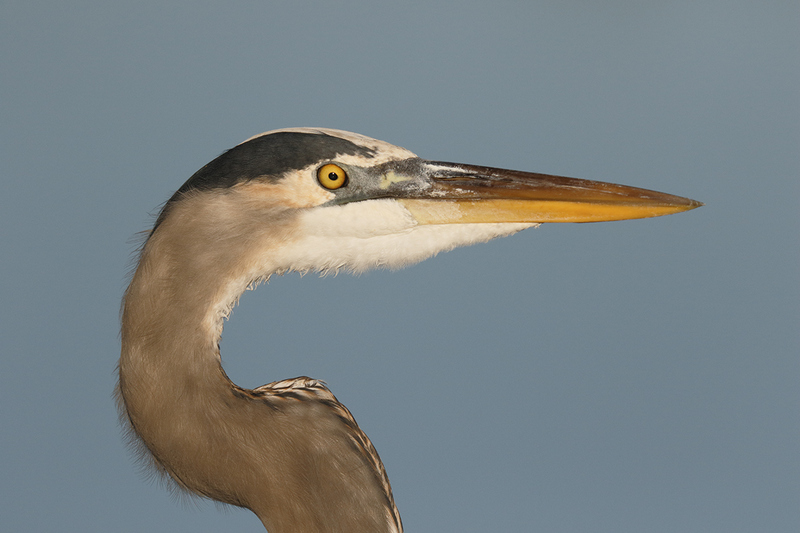 Note that in the image above, the one made with the full frame 5D III, the heron’s head is pretty much perfectly square to the imaging sensor. When working with long effective focal lengths, small or even tiny differences in head angle can have significant effects on image sharpness. When I wrote Just a Bit on the Crop Factor Debate in the blog post here, a bit of a piss fight developed with the full frame is better folks on one side of the fence and the crop factor folks on the other side of the fence. Folks in each camp were adamant that they were correct. Though one thing that neither side mentioned is the fact that not all pixels (and not all sensors) are created equal, I wisely stayed out of the discussion :). I figured that I would create some comparison images and see which were better. IMO, the crop factor of APS-C affects two aspects of image quality: DOF and noise. On the first point, if you reduce the focal length on an APS-C camera to match the angle of view on a full frame camera while shooting at the same distance and aperture with both cameras, you end up with approximately one more stop’s worth of depth-of-field. This might be a good thing for some kinds of photography, but not all. It becomes a matter of personal taste. On the second point, the photodiodes on an APS-C sensor will obviously be smaller than on a full frame sensor if the resolution is the same. This is not a big issue at moderate ISO speeds, but differences in favor of the full frame sensor become more pronounced at speeds above 1600 or so, IMO. Again it becomes a matter of personal taste. I suppose there is a third element to consider, although it is not directly related to image quality: the size , weight and cost of lenses with equivalent angles of view and maximum aperture are clearly smaller, lighter and more affordable with APS-C vs. full frame. For bird photography, I think the scale tips in favor of APS-C as long as noise levels remain acceptable. And the image quality of the 7D Mark II is good enough IMO under most lighting conditions that bird photographers are likely to encounter. The animated GIF above compares the 7D II image with the 5D III image cropped as closely as possible to the same subject size. Do note how the slight difference in head angle dramatically affects the appearance of the bird’s bill. Do continue on to the 100 and 200% comparisons below. I began by trying to make comparison images of the local cranes. I thought it would be easy to find one sleeping. It was not. Many times I’d make a few images with the 7D II only to have the bird change position. Did the lens shift on the BLUBB? I tried photographing a sign figuring that signs never move much. Those efforts revealed many variables. Was focus perfectly accurate with each camera? Were the camera body settings identical? (After several days of struggling with color I found that the 1D X that I was using inadvertently had Landscape as the Picture Style; this left a ton of MAGENTA in the BLUEs.) Did the lens move ever so slightly. Did the lens/TC/camera body in use need to be re-micro-adjusted? Whatever the subject, would small differences in the exposures or the RAW conversions effect the amount of noise? Likely so. The aforementioned all exacerbated by the fact that the 7D II images need a bit less light than the 1D X/5D III images. No. It has not been easy. I do hope to get the sign right this morning weather permitting. It is actually an interesting image. 1-The feathers behind and above the bird’s eye are sharper in the 7D II image than in the 5D III image. 2-As far as noise, the 7D II image looks a lot cleaner. Of course, as we learned above it is difficult to be sure that all things were in fact equal. None-the-less, I was so stunned by what I was seeing that I kept having to go back and check to see which was the 7D II image and which was the 5D III image…. What are you seeing in the 100% crop comparison? 1-Fine feather detail looks better in the 7D II image than in the 5D III image. Note especially the appearance of the five dark, sort of curlicue feathers in the upper right. 2-As far as noise in this comparison, the 5D III image looks a lot cleaner in the 200% comparison. Please do not ask me why. As above, we know that it is difficult (if not impossible) to be sure that all things were in fact equal (even when a heron seems to be standing still as a statue. None-the-less, it seems pretty clear to me that the 7D Mark II is an amazing camera. And when you consider the ridiculously low price, it is also an amazing value. What are you seeing in the 200% crop comparison? I will continue to try and create similar series for comparison. I am hoping to catch a sleeping Marbled Godwit at DeSoto and photograph it with all three bodies. I do not, however, expect the images to be identical :). Please understand that the sample size here–one comparison–is quite limited :). That said, I am always doing my best. It would not shock me to see that in the long run, cropped images from the 1D X and the 5D III are actually superior in terms of image quality, fine feather detail, and noise than images from the 7D II. Nor would it surprise me if the 7D II images turn out to be clearly best. Stay tuned. In the next blog post we will be taking a close look at some 7D II ISO 1600 images. Nicely done Arthur, very well done. Can we have please the original 100% raw files or 100% jpgs without any kind of sharpening or denoise applied? Because otherwise this test makes no sense nor can provide any valid information as concerning same lens from same distance fit on different size sensors test has any meaning only if samples from both at actual size are provided. What we see here is similar pixel count (pixel estate) from both sensors which is never an out-of-the-camera situation and can happen only if one of the two images is resized in Post Processing to much the other, which alone cancels any validity on getting image quality conclusions. Unless is just for specific people who have as a standard procedure to shoot APS and resize (downscale / resample) their subject to Full Frame pixel count size. You can crop an FF image to match the APS FOV to check what would be off the frame at same distance and with the same lens (resulting in a smaller MegaPixels file) but that has nothing to do with image quality checking and it appears is not the case of what being done here. Also converting to 256 indexed maximum colors palette files (gif) cancels once again any image quality conclusions validity. I was just doing what folks suggested. It has been fun though. I have offered to send any RAw file for $5 and had only 3 takers so far. Otherwise I do not understand what you wrote about above. I am pretty good at creating images but NTG with the technical stuff :). i mean please explain this. 100% crops mean no resizing. when the head of the bird in your animnated GIF has the same size… you must either change the location from where you tooe the photo, you must change the lens, or you must RESIZE the images. otherwise the head would not be the same size when compare images from ae cameras with a aps-c and ff sensor. when you resize the images it´s per definition no longer a 100% crop. how can both be 100% crops when the bird is the same size in the crops? he says he took the images from the same place with a 600mm! what he writes makes no sense. I have two points which might or might not be of interest. Little bit techy, sorry. Plus I’m hungry so hurrying, apologies for anything that’s hard to grasp. The first one is the crop factor might have been 1.6x but the previous generation of 18MP sensors only had 1.5x the pixel density, so you didn’t get a 1.6x “zoom in” with the original 7D. I did consider getting one as a cheaper way of getting more detail (rather than buying a longer light gray bank balance eater), but looking closely at some test results with well-regarded lenses it seemed you tended to get 1.2x to 1.3x the detail rather than 1.5x, presumably as it was getting further into the lens limits. (When you combine lens and camera resolution you’ll get a system resolution that is lower than either, the further ahead one is the closer to the lower one you’ll get. So for example if a lens could resolve 10MP and a Camera 10MP you might get 8MP when used together, put a 100MP camera behind the 10MP lens and you’ll probably be at 9.8MP. BTW that’s just showing the theory, they are made-up results.) Since using the Canon extenders lowered the lens resolution already I decided they were just about the same as getting a crop camera, as adding a crop camera and an extender would seem to just lose too much resolution (so FF+ 1.4x/2x was a better bet than APS, as I’m still carrying a FF camera for other shots and I already had the extenders). Oh and that’s just my opinion of what I found, not claiming to have the one true answer. On noise remember two things. Firstly the pixel noise is really only the shadow noise, so if you don’t pull the shadows a lot you probably don’t care. Most of the noise you see is just the Photon Shot Noise, the noise due to light Photons being emitted randomly (although at an average rate). This gets to be less significant the more light you capture (it goes with the square root of light intensity, capture 2x the light you get 1.4x the noise so the noise appears to be 70% of what it was). This means you don’t care about the sensor noise performance as much as how large it is (strictly how much light it can capture). That’s why FF images can look “smoother” than APS images. Secondly a lot of noise improvements in recent years have been from improved processing, both of JPEGs and Raws, less has come from sensor improvements. This makes working out the effect of the noise on the final picture quite problematic, as it depends on how well the guesses the software/firmware people went with fit the noise in a particular image (i.e. how much the detail gets damaged by noise suppression artifacts). Fun eh? JohnL: I don’t understand your post. What does it mean when you say “the crop factor might have been 1.6x but the previous generation of 18MP sensors only had 1.5x the pixel density”? The “crop factor” is the result of the difference in linear and areal measurement between the “crop” sensor and the “full frame” sensor. And the pixel density goes with area, and so because a Canon “full frame” sensor is 2.6 times the area of a Canon 1.6 crop sensor, the pixel density of the crop sensor is 2.6 times greater, not 1.5 or 1.6 times greater, than a “full frame” sensor with the same number of pixels. Of course, all this matters only if you’re focal-length limited, in other words, if you can’t get close enough. But my point is that the first half of your post was quite confusing to me, and I think it might be incorrect. David Policansky: I apologise for the confusion, I did explain I was hungry! It wasn’t my finest work… but I suspect if I’d added the extra 20 lines of explanation it wouldn’t have improved much. When I talked about 1.5x I was specifically talking about using a crop body to get extra resolution on a target (e.g. bird). Note I was talking about linear resolution as the crop factor is a linear measure (I really was trying to avoid confusion – oh well). So I was saying you don’t get 1.6x as the APS sensors used to have less pixels than the FF cameras. I then pointed out that I found you didn’t get that either, as you were further into the limits of the lens performance (assuming we’re talking the centre of the lens, the edges can be a more complicated question as the APS sensor gets a better “edge”). 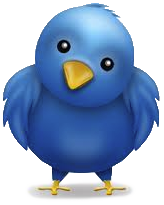 You are correct that when you take pixels over the bird as a whole it’s an area question. I only talked about linear numbers just to keep it simple (yes, I know, I didn’t do simple at all well, but adding area would have made it worse). Really on resolution I was saying two things. Firstly I found you get nothing like a 1.6x linear resolution improvement with APS bodies over FF and secondly I suspect if you have a FF camera you’re probably (IMHO) as good just buying extenders to get closer. Note buying really super-star lenses (500 f4 II? That’s more a rental option for me…) should help here in either case (probably more with the crop body). Thanks, JohnL. I appreciate your reply. I always assume the same number of pixels for such comparisons. Also, I do notice the difference in cropping ability between my 6D and my 7D. I get limited by resolution while cropping sooner on the 6D in those cases where I can’t get close enough, but where I’ve used the 6D because it does so much better than the 7D in low light. Think of two parallel lines. How close can these two lines be before you can no longer see them as two distinct lines? There are a bunch of things that limit how close those two lines can be and still obtain an image that shows two distinct lines. The sensor that sees the light and turns it into an image has a bunch of tiny sensors that see the light. The smaller those tiny sensors, the more detail you should be able to see. To understand that particular issue, consider creating a picture by putting dots of color on paper. If you use really large dots, you cannot show fine detail. So, the general expectation is that a high resolution sensor should produce more detail in the final image. It turns out that the lens also has limits in terms of the detail that it can pass. The ability of a lens to resolve detail is usually determined by the quality of the lens but is ultimately limited by diffraction (see http://en.wikipedia.org/wiki/Diffraction). So, the optics in the lens is not perfect so you have some distortion and light bouncing around…. and all sorts of things. With the first digital cameras, it seems that the sensor was almost always the limiting factor. As the sensors become better and better, you get to the point where the sensor can see more detail than the lens is able to deliver without distortion. with any lens, the light travels differently through the very center of the lens than it does near the edges. In fact, any particular point on that lens may behave a little bit differently than any other point on the lens. In general, I make a simplifying assumption that the very center of the lens probably does a better job than points that are further from the center of the lens. In other words, I expect the image quality to become worse as you approach the edges. One advantage of using a crop sensor camera with a non-crop sensor lens is that the crop factor causes you to only see the better portions of the lens. Overly simplified (like assuming that a cow is spherical because it makes the math easier), but I think that it demonstrates the general ideas of the facts. The Digic 6 will affect things like raw speed, focus, and all that other fun stuff. The JPEG enhancements are also there, but, I believe they have almost no affect on raw files with the exception of long exposure noise reduction. So, even if it offers no direct advantage to raw generation, there are peripheral things that are improved. 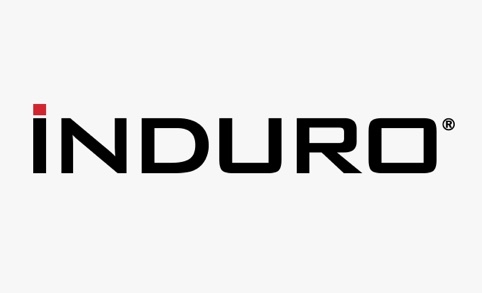 More simply stated…. Faster Digic means that you can pull an image from the sensor faster, do any processing faster, and then (if the memory bus can handle it), write the images to the card faster. Also, you will take photos with less lag, raw or jpeg, because the faster digic will focus faster so you might also have more / better in focus shots. ps: does it affect image quality? If you want to see the math that demonstrates that the DOF from a crop sensor camera is greater, drop me a line and I will dig up the proof (as in raw math, not images). When I first heard it, I thought that it could not possibly be true. So, I wrote up a 20 page document with figures, diagrams, and definitions to define things such as Circle of Confusion, Hyperfocal distance, near focus, far focus, and similar. Excellent job well done. It looks like the 7DII is a superb camera, especially for its price. Thanks again for doing such difficult comparison between the 7DII and 5DIII. I am one of the boys and girls that really appreciate the extra work you are doing to enable the comparisons of Image Quality. For giggles, at ISP 1600 or higher, it would be fun to thro the 7d original into the mix. Not gonna happen :). I already know the results anyway…. In the blog you mentioned two items that created challenge for you, so I though I would offer 1suggestion, and one explanation. 1- you mentioned (paraphrasing) that you were reliant on assuming both sets of images achieved perfect focus. Rather than worrying about all the MFA combinations, since you have a ‘stationary object’ why not use live view contrast detect for known perfect focus to eliminate the AF Variable. I will try that with the sign though I worry that the box is so wide…. 2- you mentioned not understanding pixel math. Maybe this will help. Let’s put aside different pixel quality. We start with two sensors, one full frame (36mm wide) and one crop sensor (1.5x is 24mm wide). For now, let’s assume both cameras/sensors each have 6000 pixels across their sensor width. Each pixel is a receptor capturing a focused sample of light. Now, We put on the same lens on each camera. The lens projects the image onto the focal plane (where sensor resides), and fills up the full frame sensor by design. The crop sensor will capture the middle 24mm from this full frame focal plane image from the lens using all 6000 pixels to capture this smaller part of the image. Is not the center the sharpest part of the lens? First background on displaying or printing the image. The basis for quality is the number of pixels capturing the subject. I mentioned 6000 pixels. To display, it must be decided how many pixels per pinch we want to display or print. We can print/display 60 inches wide, which would only give us 100 pixels of info per inch (like on a high res monitor), or we can print/display 10 inches wide and out 300 pixels/inch and be able to use high quality print with no visible distance between pixels. I am lost already. I like creating pictures :). Let’s assume a bird is photographed at the proper distance with the lens such that the whole body fills up the width of crop sensor full 24mm. Pretty good, we get all 6000 pixels across the key subject of the image. This same bird however would now, with 24mm on the full frame sensor, only 4000 pixels to capture the image. IF we now display both Images on a large display using 100 pixels per inch, the full frame image will be 40inches wide, bit the crop image 60inches wide. This is the Crop in action, captures more detail with more pixels…In order to compare the two images side by side, we must change the size of one of the images, either in raw dimension or display pixels per inch. When you lined up your images, for the two camera comparison, we know you didn’t change the display size of the monitor, so you either up resolutioned (added calculated pixels) to the 5d3 image to get to 6000, or down sized the 7d2 to the 4000 pixel size. This let them ligh up as same size for your gifs. (it would be nice to know which). When we upres, the sharpness isn’t as good as native, and downres’ing helps eliminate noise specs. So there you have it, when a subject fills a crop sensor but only a portion of the full frame, you get the crop factor from the increased number of pixels capturing the subject. I suspect that you upres’ed the 200% comparison, because the 5d 3noise got smeared or spread smoothly to fill the new pixels, whereas at 200%, the 7d2 the noise seemed more discrete than at 100%. Both ways up/down have benefits so it depends on the end usage. If for screen display, I would compare with , if for print, and needing all possible pixels, up’res’ing. Did this help at all?? Nope. I think part of my problem is that I do not want to take the time to read/study/understand it. As I said, I like making images :). But thanks a stack for trying. So, why is there a debate of the full vs crop? Because the full frame sensors are large and higher quality, and the number of pixels are often higher so that the 24mm worth on full frame sensor is more than the 4000 in this example and reduces the crop factor a bit though digital zoom capability. Will use your link for purchase. Thank you for the comparison, that I have found very interesting, and that confirmed what I was thinking. It would be interesting to make a similar comparison with a less sharp lens, like the 100-400, to see if a file produced by the 7d2 is still better than a cropped image of the 5d3. I have a question concerning the RAW conversion with DPP: the noise reduction was set to zero in both the pictures? Thanks Artie, a really great way to display the 5D3/7DII comparison. I am impressed at how well the 5D3 image stands up to all that cropping. Any PP or noise reduction applied to either of these images? A similar comparison between 1DX and 7DII would be informative as well. Looking forward to the 1600 ISO images from the 7DII. I applied NR as per our original DPP RAW Conversion Guide. No post-processing at all. I will do a few more comparisons surely one or two involving the 1D X. I think that I got the sign pix right this morning. Tomorrow for the ISO 1600 stuff. Hi, Artie. Thanks for all the work you have been doing on this, and also for explaining that it was done at least in part in the hope that “the boys and girls here will thank you” by using one of your affiliate links. Hah, too late in my case, I already did more than a month ago! 🙂 But it’s worth recapping why. It was clear that even if the 7D2 had the exact same sensor and IQ as the original 7D, the advancements in performance alone would be worth upgrading for. But it’s clear it won’t have the same IQ; there have been 5 years of technological advances. The pixel peepers are complaining about lack of dynamic range and other esoterica, and your images have made clear that that stuff is irrelevant for what we do (and who’d buy a 7D2 primarily for landscapes and portraits, anyway?). In answer to your specific questions, I do see more noise from the 7D2 at 200%, but heavens, not that much, and I’ll never ever be trying to make good images that need that degree of cropping. Lack of focus, motion blur, and atmospheric conditions will bother me more than noise at that stage! Amazing comparison and amazing results. Thank you. Art – this reply risks turning into a love note so sit tight. Yeah, I know it’s a public forum and that’s just fine w/me. First of all, thank you for sharing your genius, creativity, experience and knowledge so freely. I, for one, am a better photographer just from reading your blog which is both educational and amusing at the same time. Sometimes you make me laugh out loud so thanks for the grins too! The latest being your blog re “Mr. Famous Bird Photographer’ and the clipped images you produced It’s heartening to know that even someone with your skill and experience has the same down to earth photography moments I do. Thanks for being willing to share the spectrum of your photography from superb to whoops!. 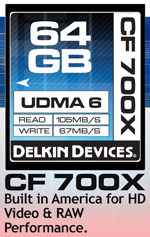 Thanks also for the exceptional and ongoing reviews you have been providing for the 7Dmkii. I own a 7d, 5dmkiii and a 1dmkiv. 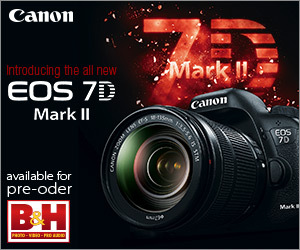 I just placed my order w/ B&H – using your link – for the 7dmkii. I plan on selling the 7d and the 1dmkiv. I see you currently have a 1dmkiv on your Used Gear forum so will ck in separately as to how best to proceed. Lastly, I wish to heck that I had enough flexibility to jump in on some of your great IPTs and trips. I’m still working – in a job w/ a traditional corporate M-Fri, 9-5 schedule, so I hold my breath each time you post a new trip. So far the dates have not synched up w/ vacation time available. I look forward to joining you when they do. Cheers! Thanks so much Art.This whole process has been very informative and interesting.One thing for sure is that the 7DII is light years ahead of the original model which I own but seldom use preferring an old 1D MarkIII which is a good compromise between full frame and APS-C sensors. Thanks again for your efforts and if I order The 7DII I will be sure to do it through you. Pitting an APS-C body against full frame, for the very least, the APS-C is at least equal, possibly better! I’m convinced that the 7D mark ii is going to be a landmark Canon DSLR that’s going to set a new, pretty high standard for APS-C bodies. Just thinking…if this is the new standard for crops, can you imagine what the new full frame DSLR will be like!? As an engineer by background, I’ve found the crop vs. Full frame debate to be far more emotional than logical. While I understand the “effective magnification” effect that folks refer to with a comparison of crop sensors to full frame sensors, I think it is important to remember the optics are unchanged. The effect comes solely from how much of the image light is put on the sensor. None of the cameras put all of the gathered light on the sensor, because the image would be circular if so and the pixels on the sensor corners would go unused. So the image is really cropped by all sensors to end up with a rectangular image from the sweet spot of the optics. The technical issue would appear to more about how much of the light that is gathered by the optics is actually used by the camera (by being spread on the sensor), as well as how effectively the sensor then uses it. Pixel density and other camera hardware and software design considerations ultimately impact resulting noise, light sensitivity, sharpness, etc of the digital image that is made from the light that is used. In the end it is how the image looks to us that matters, which has to be a subjective judgment, so I guess this debate will persist. But I believe Moore’s Law from the computer world has a corollary here, best summed up as follows: cameras keep getting better, so comparing the newest technology to that of a couple years ago probably makes little sense. But the camera that you can afford and like! I think Barry has hit the nail squarely on the head. Thanks for doing all this work Arthur, I know its a lot of work. I agree with you the debate is stupid and to me the image quality looks excellent and people should easily be able to make professional images with this camera. Thanks. I never said that the debate was stupid :). Simply put, it is a great value, a great camera, and I love the images. This reminds me of the high school lunch room debates about Ford vs Chevy. It seems to me that if you have to look that closely and are that unsure about the conclusion, it makes no sense to worry about it. The big factor for me is that the “built in tele-extender” on the 7D2 does not lose an f-stop of light like the add on one would. Canon has obviously done a great job on the new generation of crop sensors. I don’t know what has gotten into the Canon engineers lately but all the new stuff is extraordinary. Now if they would just bring back the big red square focusing point! Thanks Art, you’ve convinced me on the 7DII. Actually, I was already convinced and ready to replace my 7D, so I’ll remember to link to B&H via your web site when I do. BTW, I don’t see any significant difference between the two cameras here, with possibly a slight edge to the 7DII. Nice job doing admittedly a difficult real world side by side comparison. Thanks much Artie for taking these photos and providing us valuable information to make an early decision on the 7D MK2. It seems to me if we are going to 200% crops and having to find slight differences in image quality between this new camera and the 5D Mk3 that for 90% of what most people shoot the 7D Mk2 image quality will be fine. Now it comes down to seeing if the features of the new camera are valuable to you. I have a 7D now and a 5d Mk3. I will be selling my 7D and buying a new 7d Mk2. The batteries are interchangeable between the two cameras and that lets me pack a reasonably light kit with a lot of versatility. Both bodies together are still less expensive that one 1DX. The flexibility outweighs the gains I might make with the 1DX. Again Artie, thanks for this extremely helpful information. Thanks and agree 100%. I still have to learn a lot about the 7D II…. And YAW. Could it all be about pixel density and equivalency. If we took the 7D Mark II’s 20.2 MP sensor and increased it to a full-frame size it might be 40MP or so. Thanks for all your good work. Actually it would need to be a bit more than 50 MP. But the actual results are so impressive! If we’re dealing with the same pixel density why wouldn’t it be 20.2 MP X 1.6 = 32.32 MP full-frame equivalency? No, the correct calculation would be 20.2 Mp x 1.6 x 1.6 (because you are enlaging both x and y dimensions of the sensor, not just one. Wow, 51.72 MP! Makes sense though – thanks! If you don’t mind – why then don’t we see 51.72 MP full frame Canons? You’d have to go to a much larger (36.7 x 49.1 mm) sensor like a $40k Hasselblad to get 50MP. Are the smaller pixel sizes that much of a drawback? A lot more questions to be answered, things to be tried, than it seemed there would be. Do you know somebody who would have a large STUFFED bird? At least that one would not move. Thanks for the effort you put into the blog. Artie, Nicely explained and illustrated. I stumbled across this blog looking for 7DMII info. Thank you for putting this together! I am impressed, that in this example, the 7DMII does so well against the 5DMIII. I think this might say that not one camera is the best for all types of photography all the time. The smaller sensor camera does have its advantages. In the 100% crop, the noise does look a little better in the 7DMII picture. It could be a statement of how good the Digic 6 JPEG engine has improved. In the 200% crop, I am not sure if I am seeing more noise in the 7DMII as much as I can see a little more detail, which makes sense since it is a smaller sensor and there will be a higher pixel density vs the 5DMIII more cropped image. It would be interesting to see this comparison at higher ISO. I am not sure the 7DMII would do as well. But who knows?